The release of this new series after Dr. King's recovery has drawn much attention and interest on how he completely recovered from 4th stage metastasized melanoma cancer - only from a totally natural approach. The cancer penetrated the forehead tissues into the skull, spread to the lymph nodes (esp. the neck) traveled to the spleen and spread to the right femur bone (largest bone in the body) and was advanced and moving aggressively. Plus, A FREE Extra 3 DVD Set Of A Second Cancer Seminar! 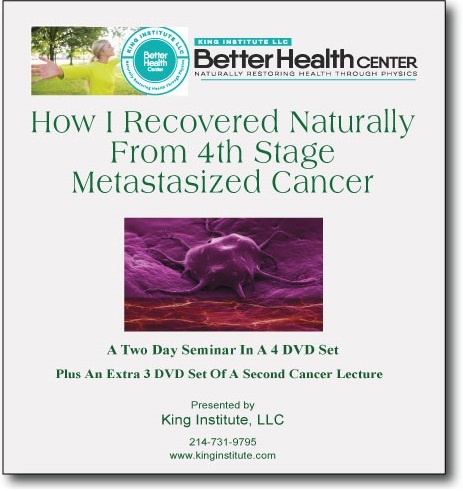 "How I Recovered Naturally From 4th Stage Metastasized Cancer" on a DVD set. Now available by contacting the Better Health Center. The release of this new series after Dr. King's recovery has drawn much attention and interest on how he was able to completely recover from 4th stage metastasized melanoma cancer - only from a totally natural approach. The cancer had penetrated the forehead tissues into the skull, spread to the lymph nodes (esp. the neck) traveled to the spleen and spread to the right femur bone (largest bone in the body) and was advanced and moving aggressively. Recovery only took eight months! Get the full story and the seminar handouts on this 4 DVD set. The 1st seminar was $499.00, while this DVD set is only $399.00!